When I was 12, I went to stay with my aunt and uncle out of town for a week. I had a fun time overall, but what I remember was cooking with my aunt. She’s a wonderful cook; she’s Italian and knows how to make wonderful Italian food, but she also taught me how to make great basics like pie (I still owe her for the fact that I can get the perfect flaky pie crust every time!) and a variety of breads. They had a bread machine, and it was the first time I’d ever used one, and I wanted one ever since. It wasn’t just limited to bread, but could make pizza dough, bagels, muffins…you name it! When I moved to Berlin, I bought one. I got it used off Kijiji (now Ebay Kleinanzeigen) for 15 Euro. While I love the art of making bread totally from scratch, it’s a time consuming process. I don’t like to consume a lot of wheat, so making my own bread is usually necessary, and it’s much cheaper and better than store-bought rye and spelt breads. I can also add all sorts of things to my breads, such as cheese, olives, oats, rosemary, flax seeds, raisins and more. 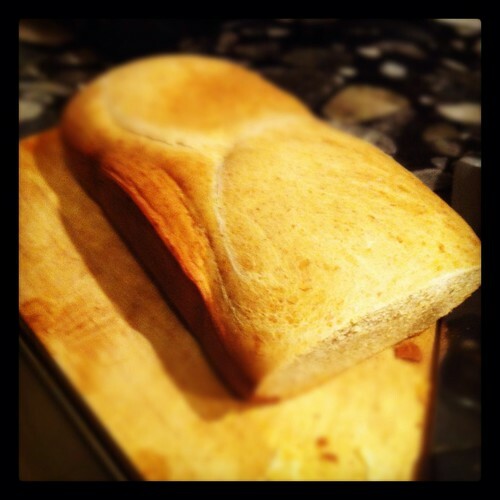 I love the bread machine because it lets me make really great, homemade bread overnight. I usually just put in the ingredients and turn it on and go to bed. I wake up the next morning and smell fresh bread, all ready to have for breakfast. It’s actually faster than buying bread! I can also run it while I’m doing things around the house. Out of all my kitchen appliances, it’s probably the one I use the most (save the oven and microwave). I know that bread machines are something a lot of people buy or get as gifts and then store at the back of a closet only to collect dust. I’ll never understand this. If you are one of these people, I urge you to dig it out and commit yourself to using it! **Thank goodness for Instagram, which allows me to take photos in crappy conditions and have them be somewhat passable.